On a recent trip to the West Kootenays in BC, I found a couple of plants that invited closeup photos. Both are familiar: one is a shrub, often found in my home area, in fact, and even around the edges of my garden. The other is a tree I seldom see because it isn’t native to BC. The bush is snowberry—but I think a couple of its other names, waxberry and ghost berry, are utterly appropriate. They grow wild around vacant properties near my home (and across Canada), but this one was planted as an ornamental in a small formal garden below the hotel in Nakusp where we spent a night. Apparently it is unusual precisely for those white berries (known as drupes) which not many plants produce. I’ve seldom seen anything eat them so they may persist right through the fall and winter. But sources says they are on the menu of bighorn sheep, white-tailed deer and grizzly bears, as well as some birds. Even though they are poisonous to humans, that shouldn’t stop you from using a branch or two of them as fall decorations on the front door. The tree belongs to the red oak family which has pointed leaf lobes. This oak isn’t native to western Canada, and so was planted as an ornamental on the walkway that runs alongside the Upper Arrow Lake which forms part of the Columbia River passing by Nakusp. I collected an acorn (they’re also called oak nuts, of course) from those littered under the trees. Growing up in Ontario, where oaks are common, I remember painting faces on these rotund little figures with jaunty brown berets. We can eat them, but they take considerable work to process: cracking, soaking in water to reduce the amount of bitter tannin, roasting, grinding. Best leave them for jays, ducks, squirrels, mice, deer, rabbits and other critters. Acorn woodpeckers relish them, obviously, but that bird’s habitat is far south of BC (we saw them at Clear Lake, CA) where oak forests provide this main diet item. Yeah, you read that right. Take a look at this photo, and I’ll bet you agree that is an apt description for this image. 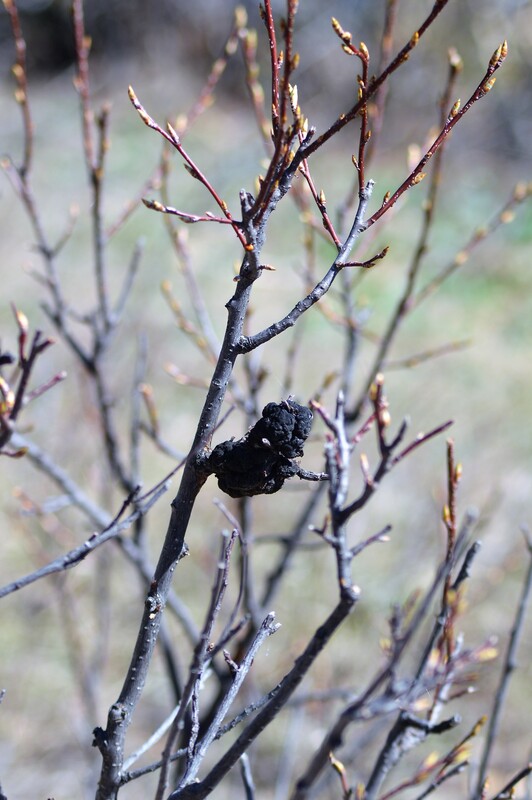 On a recent visit to Saskatchewan, on a hike, we saw this curious fungal tree disease on chokecherry bushes. I recalled having seen it many times before but I don’t remember wondering what it was. 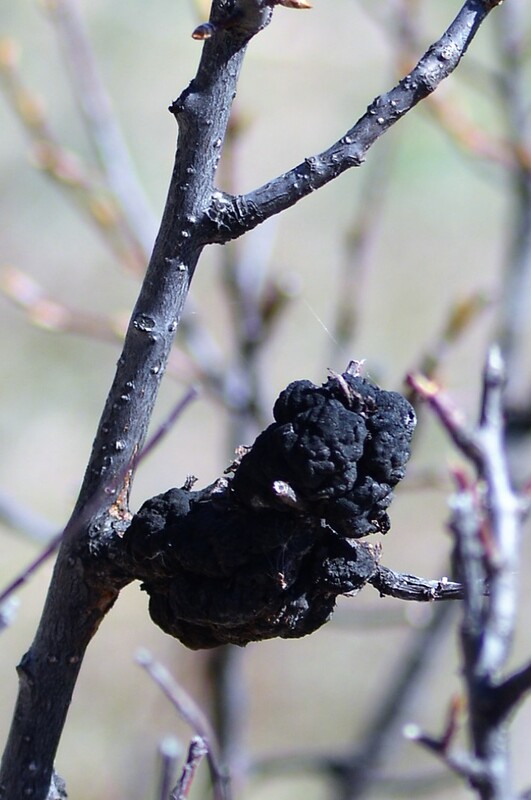 This is actually black knot fungus. It affects small shrubs of chokecherry or pin cherry in natural areas, especially on the prairies. Spread by spores like all fungi, it is mostly carried by rain to other bushes. It develops under the bark at first, so what you see as blackish lumps surrounding the limb is the second year growth. It is not considered harmful to humans, and a cherry tree can be pruned to control it. Never had I heard it labeled so perfectly, but, I mean, it is often at just the right height, so… . Anyway, I won’t forget the name, now. You? I just finished writing 10 Routes That Crossed the World, due to be published next April. So trails are on my mind…..
On a hike along Reinecker Creek trail (above Margaret Falls in Herald Provincial Park) recently, I found something of interest. This huge fungus is called a conk. 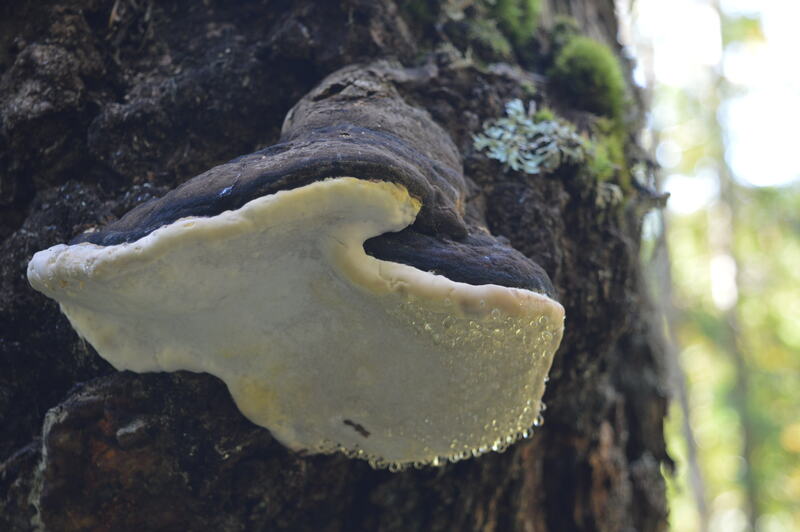 It is one of over 1000 species of polypores (a group of fungi). Its presence on the tree trunk means there is probably a fair amount of decay inside the tree. Spores on the underside of this fungus will spread the infection to other trees through an open wound, or via insects or birds. For instance, a woodpecker might take the spores from this tree to another one. Conks can vary in size; this is one of the largest I’ve seen. They can be different colors, but the large white under surface can be used by artists—hence the name ‘artists’ conk’. Scratching it, or rubbing will create a design that will remain once the conk has dried. Might be a neat place to write a story! What do you think of this whopper of a spud? I grew it in my garden this summer. When you dig them up, of course, you never know how many you’ll get from a plant, or how big they might be. I got a variety of little ones and normal sized ones and then….wow, this beast weighted in at almost a kilogram. An unexpected prize from the garden! One chapter in my book, 10 Plants That Shook the World (Annick Press, 2013) tells how potatoes became such an important food after the Spanish took them from Peru to Europe in the 1500s. They became so popular that millions of people in Ireland starved during the 1800s when blight killed several years of potato crops. 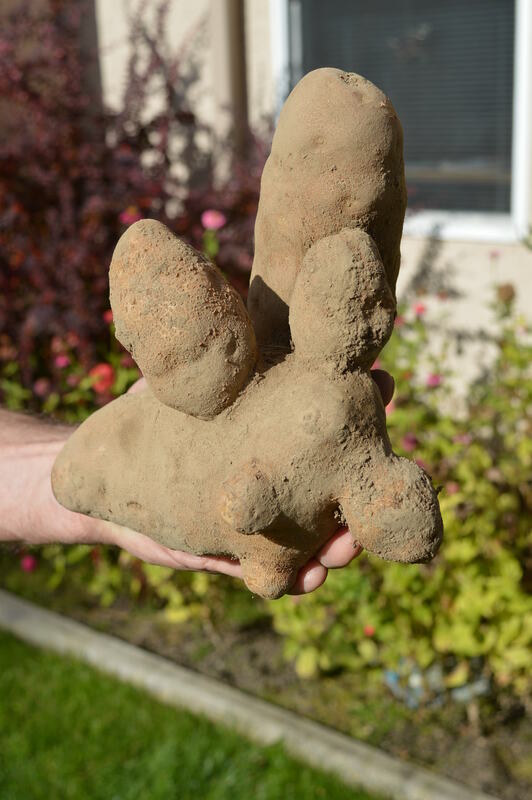 This weird potato might not win any awards, but my book has won a few prizes. Many plants aren’t ‘earth-shaking’ like those in my book, 10 Plants That Shook the World (Annick Press, 2013), but look around a summer garden and they make you wonder…..
For instance, why are there so many different shapes of flowers? All are designed to attract pollinators like bees, butterflies or hummingbirds which touch parts of the flower while seeking food, and then carry pollen to another bloom. Having such an assortment of shapes guarantees that biodiversity — the incredible number and variety of living things on Earth – will continue. 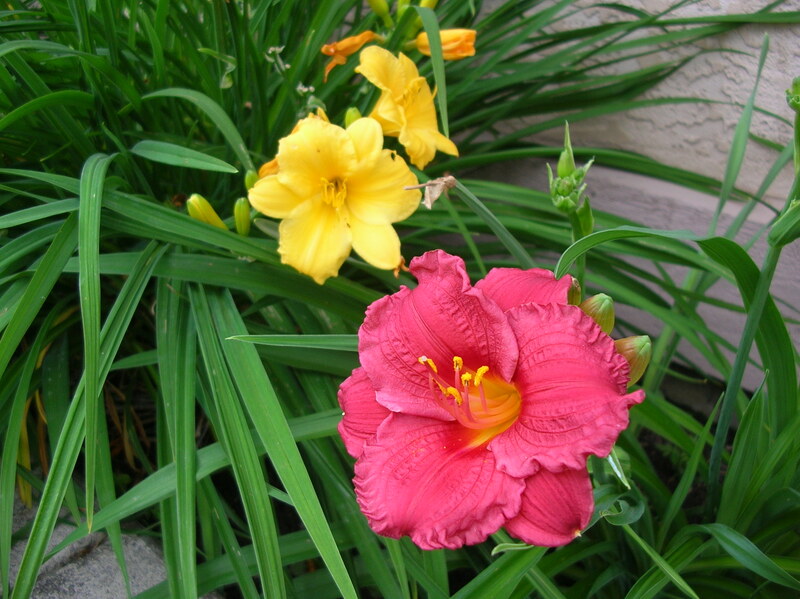 Here’s a daylily: it has several blooms on each stalk, but each bloom lasts only one day. It’s cup-shaped, so bees are funneled into the centre where they pick up pollen. 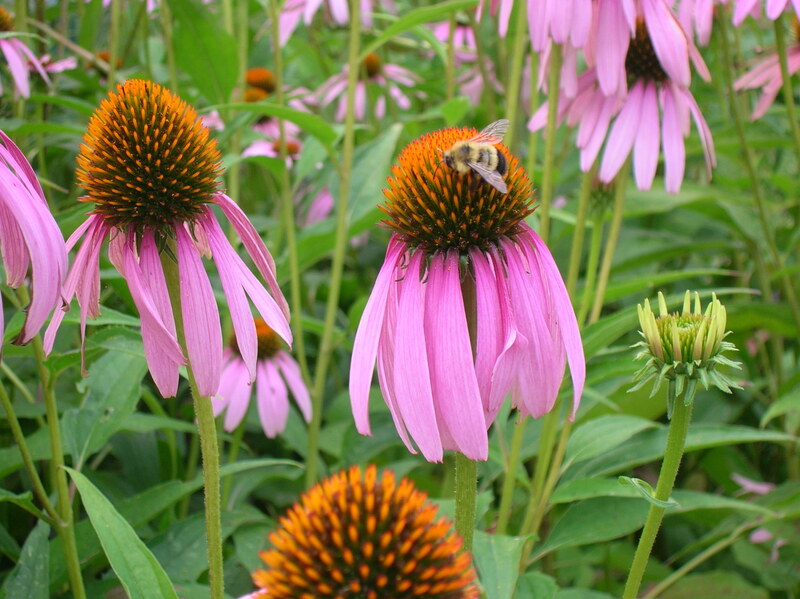 But here’s an Echinacea, or coneflower. Its petals seem to stretch open until the bloom is almost inside out, hanging down so the centre holding the pollen is thrust upwards – easy for a bee to see and explore. 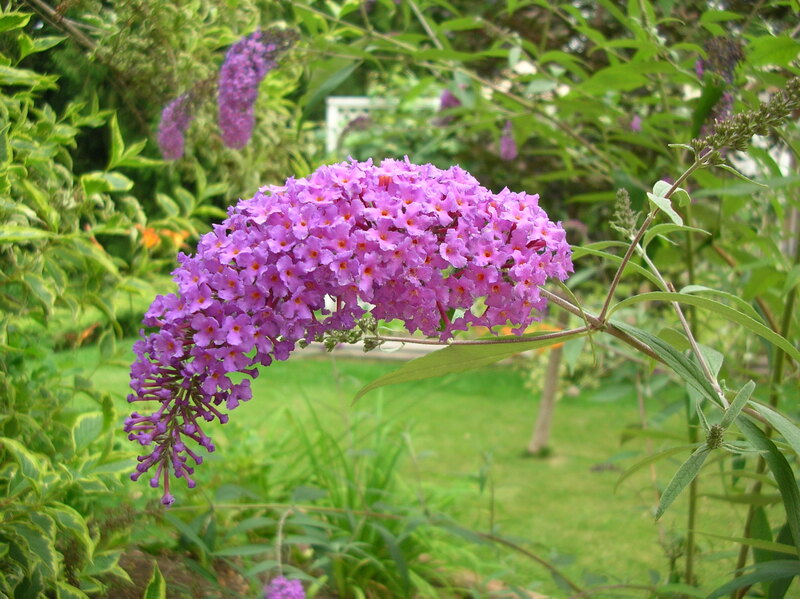 And this one is the bloom on a Buddleia, or butterfly bush. It’s large and free-hanging, but look closer. It is composed of many small florets. Individually they wouldn’t allow a big bee to enter, but hummingbirds can poke their needle-thin bills and tongues into each one for nectar. All have different shapes and sizes, yet each of these flowers has a successful way to attract the agent that will ensure the development of seeds for a new generation, and ensure the endless variety of garden flowers. 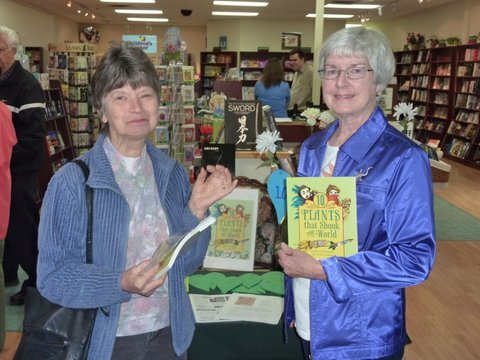 What better time to launch a book about plants than during Earth Week! 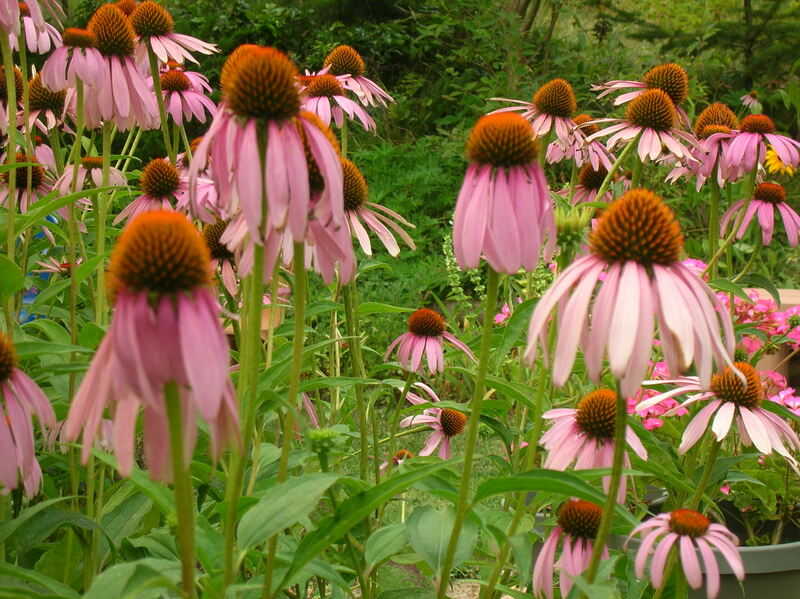 10 Plants That Shook the World …. 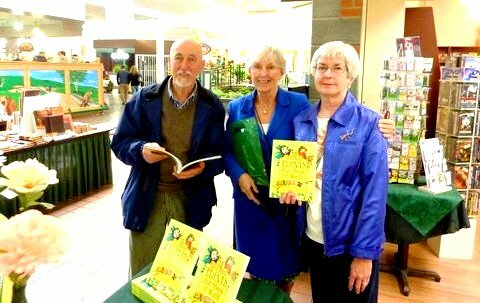 attracted attention at Bookingham Palace Bookstore in Salmon Arm, BC on Saturday, April 20. 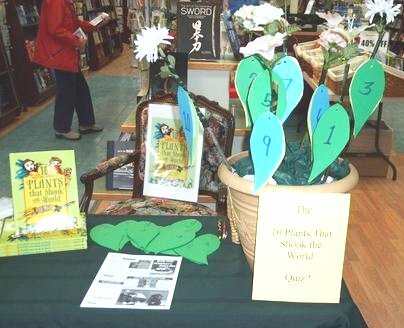 Just for fun, I set up a quiz to guess the identity of the plants from several clues. 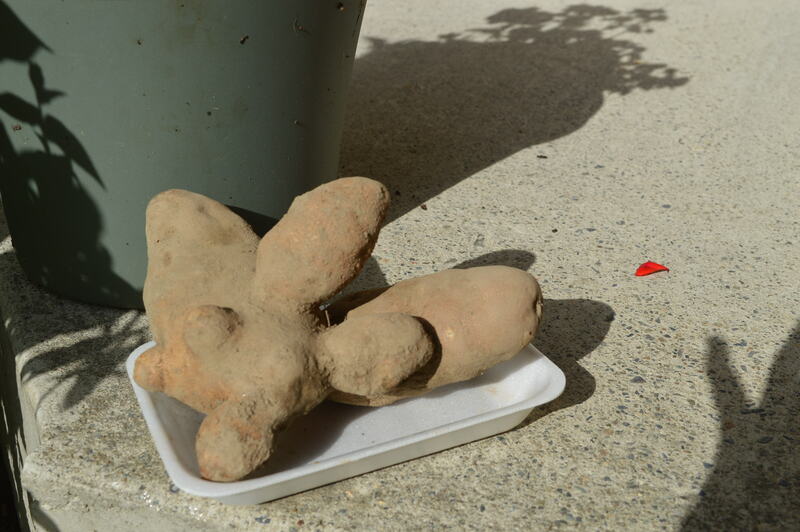 A few friends dared to try it, and their reward was a chocolate pepper cookie (with sugar and potato flour, the recipe made use of 4 of the plants). The bucket of flowers was created with reused and recycled material – in honor of Earth Day. 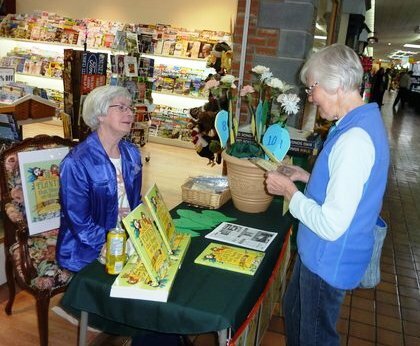 Thanks to everyone who came by, to the bookstore staff for hosting the event, and my photographer. Thanks, Judith! It’s cotton! The shrubby plant grows puffy white flowers called bolls. The fibers are woven into a practical fabric favored for so many things from t-shirts to tablecloths. Demand for it was so high in the 1700 and 1800s, the workforce included young children in England and African slaves in the US. 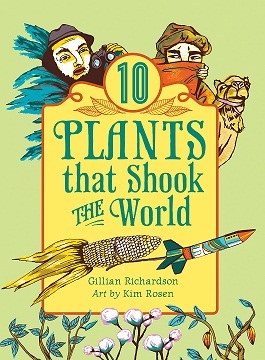 My new book, 10 Plants That Shook the World (Annick Press) has just been released. 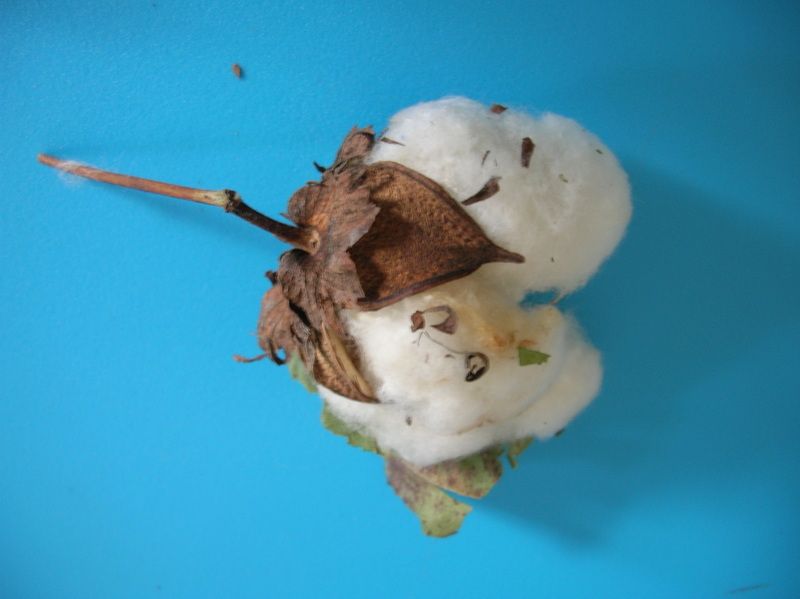 You can learn more about cotton, as well as other neat plants. Check it out at your local bookstore!